This classic (homemade!) 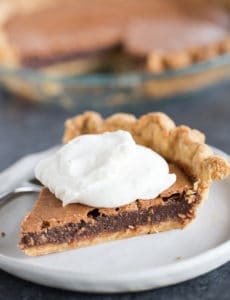 chocolate cream pie recipe features an Oreo cookie crust, a rich chocolate pastry cream filling, and is topped with fresh whipped cream. One summer a number of years ago, I decided that I needed to make more pies. 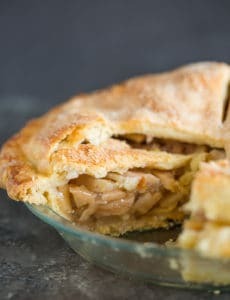 And not just any old pies – I really wanted to focus on some of the old-fashioned pies that had never graced my kitchen. I’ve made fancy creations like banoffee pie, salted caramel apple cheesecake pie, and s’mores pie, as well as classics like pumpkin pie, blueberry pie, and banana cream pie, but at the time I wanted to go back to classic and simple… to cookie crumb crusts and whipped cream toppings. Finally, chocolate cream pie entered my life! Watch How to Make Chocolate Cream Pie! And not just any chocolate cream pie, but by my estimation, the BEST chocolate cream pie you’ll find anywhere. 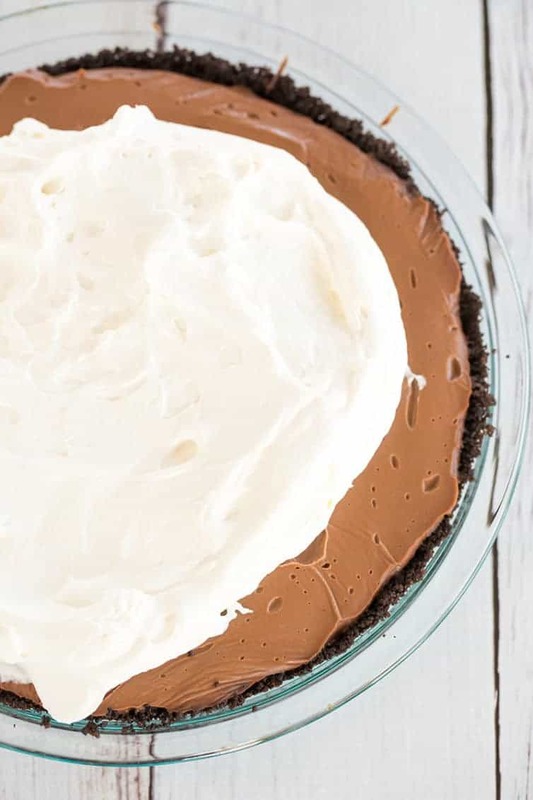 How do you make chocolate cream pie? 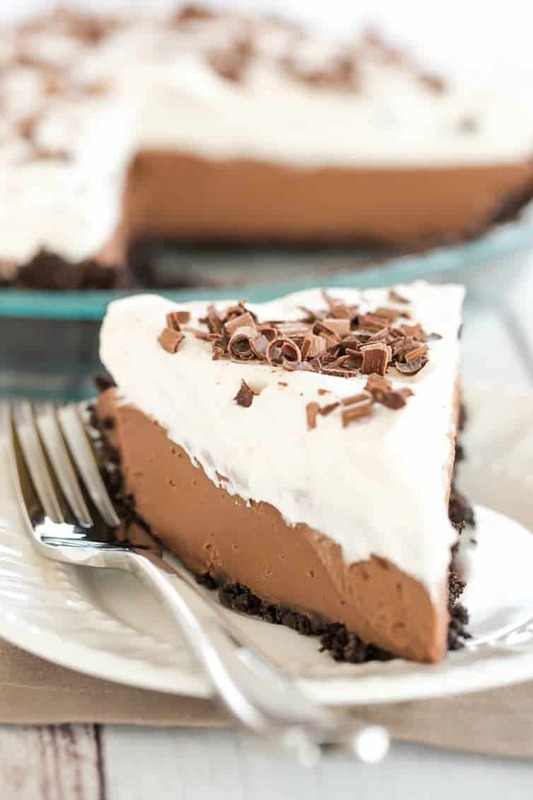 There are a few different options when it comes to a chocolate cream pie in terms of crust, filling and topping, but there are two main camps – a homemade chocolate pie made with chocolate pastry cream, and a chocolate cream pie made with pudding. 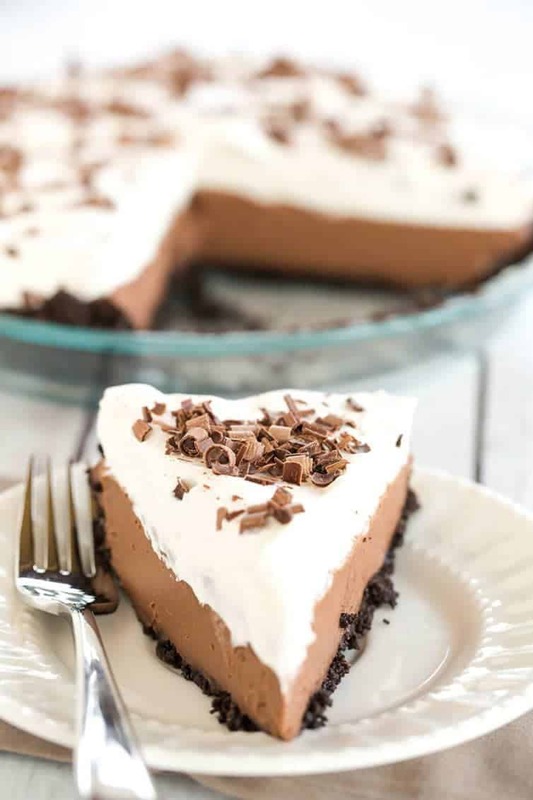 I saw a lot of different types of recipes for chocolate cream pie while researching – some that had a traditional pastry crust, some with an Oreo crumb crust… some with a classic pastry cream filling, some with chocolate pudding filling, some that used gelatin as a stabilizer… some with a whipped cream topping and others with a meringue. In the end, I decided more chocolate is always better and went with the Oreo cookie crust over a pastry crust. Homemade pastry cream makes me weak in the knees, so it was no contest when it came to the filling. Finally, I’ll choose whipped cream over meringue any day of the week so that decision was easy as well. 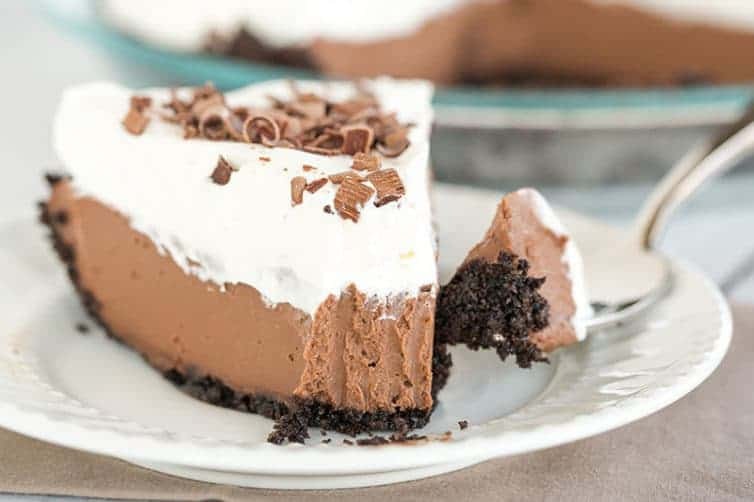 The result is a wonderfully creamy, smooth-as-silk pie loaded with chocolate in every bite. Don’t be surprised if you end up standing over the counter, eating it from the pie plate with a fork. (ahem) Don’t say I didn’t warn you! A classic chocolate cream pie with Oreo crust, chocolate pastry cream filling and fresh whipped cream. Make the Crust: Preheat oven to 350 degrees F. Combine the Oreo cookie crumbs and the melted butter in a medium bowl and toss with a fork until the crumbs are evenly moistened. Transfer the crumbs to a 9-inch pie plate. Press the crumbs evenly into the bottom and up the sides of the pan, forming a crust. Refrigerate the lined pie plate for 20 minutes. Bake for 10 minutes, until the crust is fragrant and set. Cool on a wire rack while the filling is prepared. Make the Chocolate Cream Filling: Bring the half-and-half, salt and 3 tablespoons of the sugar to a simmer in a medium saucepan over medium-high heat, stirring occasionally with a wooden spoon to dissolve the sugar. Stir together the remaining sugar and cornstarch in a small bowl. Whisk the yolks thoroughly in a medium bowl for about 30 seconds, until slightly thickened. Add the cornstarch mixture and whisk until the mixture is glossy and the sugar has begun to dissolve, about 1 minute. When the half-and-half reaches a full simmer, drizzle about ½ cup hot half-and-half over the yolks, whisking constantly to temper; then whisk the egg yolk mixture into the simmering half-and-half. Return to a simmer, whisking constantly, until 3 or 4 bubbles burst on the surface and mixture is thickened and glossy, about 15 seconds longer. Off the heat, whisk in the butter, one piece at a time, until incorporated; add the chopped chocolate and whisk until melted, scraping the bottom of the pan with a rubber spatula to fully incorporate. Stir in the vanilla, then immediately pour the filling through a fine-mesh sieve set over a bowl. Using a spatula, scrape the strained filling into the baked and cooled crust and spread into an even layer. Press plastic wrap directly on the surface of the filling and refrigerate the pie until the filling is cold and firm, about 3 hours. Make the Whipped Cream Topping: When ready to serve, beat the cream, sugar, and vanilla on low speed until small bubbles form, about 30 seconds. Increase the speed to medium and beat until the beaters leave a trail, about 30 seconds more. Increase speed to high and beat until the whipped cream is smooth and thick, forming soft peaks, about 20 more seconds. 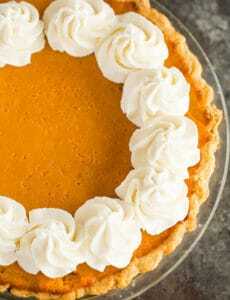 Spread or pipe the whipped cream over the chilled filling and serve. Leftovers should be stored, covered, in the refrigerator for up to 2 days. To crush the Oreo cookies, you can use a food processor to grind them into fine crumbs, or you can put them in a resealable ziploc bag and crush them with a rolling pin. Half-and-half is a common dairy product in the United States; if you can't get it where you are, substitute half heavy cream and half whole milk. Can I just use whole milk and cook it down a little bit more?